In the previous article (static electricity), we have seen the details of static electricity, which is the base of electricity. In the previous article, we have also seen that we need some imbalance to provoke the electrons. Now the question is, the imbalance, is it the concept of voltage? And the flow of electron is it the concept of current? Before getting started with the basics of voltage and current, I would recommend you to read the article about static electricity, it will help you to understand the concepts more easily. So, we will start with the basics of voltage and current. Let’s say you have a box in your room, and you need to move that box to your main hall, as shown in figure below. To do that you will need some energy, right? By using energy, you moved that box from your room to your main hall. Box were there already in your room, but to move it from your room to your main hall you needed to apply some energy to it. 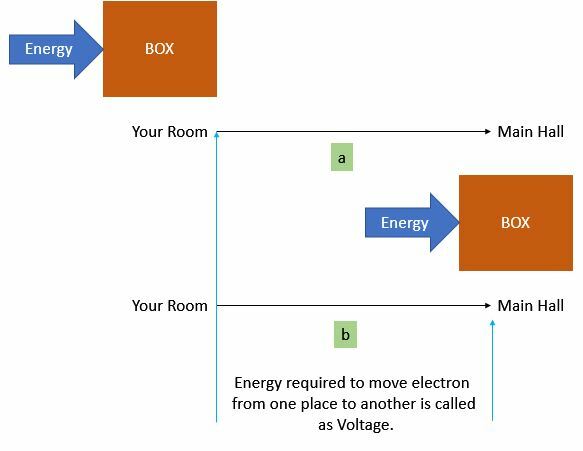 The concept of voltage and current is not much different than the concept of moving a box from your room to your main hall. The box is already there, the electrons are already there, you need a force to move that box, you need a force to move electrons, and that force required to move the electrons from one place to another is called as voltage. Or simply, you can say that, voltage is the force required to move electrons from one place to the another. So, when we rub glass rod with Silk cloth we actually create an imbalance between the electrons, and because of this imbalance the electron tries to move, or simply you can say that we have just applied the energy to our box. These electrons with the imbalance is called to have potential energy. why potential? because it has a potential to move from one place to another if we give them a path. The voltage is always referred between two points and hence it is also called as potential difference between two points. When we are saying that we are moving our box from one place to another place we’re actually talking about the two places, or simply between the two points in case of electrons, and that is why the voltage is always referred between two points. Now the question is, do we always need to rub something to create this imbalance of voltage? The answer is no..! You don’t need to rub two things to create the imbalance or voltage. Remember to measure something we need unit, and to measure voltage we have VOLTS. Now, let’s know about the concept of current. To understand this, consider that, you have a water tank, to which you have connected a pump. Now, to make the water to reach its destination you will need to start the pump and provide it a path or simply you have to connect a pipe to it. As soon as you start the pump, water will start moving to its destination, through the pipe you have connected. What if, your pipe is broken in between or you have not started the pump, what will happen? Right…! Your water will not reach to its destination. Now from this we can have two important conclusions. Water needs path to flow, a closed path…! So, if you have understood the above concept, you have understood the concept of current. As you have applied the voltage that means you have started the pump, now, the only thing you need to do is, provide it a path, like we connected a pipe for the water. So, provide a path by connecting a conductor, and bingo your electrons will start flowing through it. And this flow of electron in a closed circuit is called as CURRENT. If your conductor is broken like the pipe, or if you haven’t applied voltage, like you haven’t started your pump, your electrons will not flow either, like water. Remember, if you want electrons to flow continuously you will need a closed path for them. To measure current, we have AMPERE. And one more thing you have to remember here is that, electrons will keep on moving continuously, until the voltage keeps pushing them. This single direction flow of electrons is called as “Direct Current”, and if current is changing its direction than it is called as “Alternating Current”. You can also watch video on this topic, just click on the link below.